We've heard a few things about the rumoured Samsung Galaxy Note 12.2 tablet, and it seems like we could be learning a fair amount more in the coming months. As both an LTE (SM-P905) and a Wi-Fi only (SM-P900) version have now cleared the FCC, we're slowly gearing ourselves up for an approaching launch, which might be timed rather nicely with CES 2014. The news puts it in line with details we heard a few months ago from @evleaks, who touted a 2560x1600 screen and an Exynos 5 octacore CPU. The FCC clearances tell us a few things will be on board, like a 14.1-inch diagonal measurement, dual-band Wi-Fi and LTE, as well as appearing to confirm @evleaks's claim of an S-pen. This size also puts it in line with reports that a Chinese firm was producing a 12.2-inch screen for Samsung. Samsung vs Apple: Round 12? 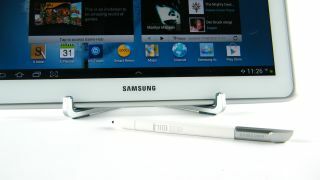 A 12.2-inch Galaxy Note tablet would also provide stiff competition to a rumoured 12.2-inch iPad. Whether that one is true or not, evidence is certainly mounting that Samsung is set to launch a tablet eviathan. It's less than two months until the next big Consumer Electronics Show in Vegas, and we'll be there to let you know if Samsung does indeed drop some 12.2-inch tablet-y goodness.